2018: Pirelli World Challenge, TCR Class with Bryan Herta Autosport (BHA) using the Hyundai i30N TCR Race Car. The BHA Team earned the Teams’ Championship, Hyundai earned the Manufacturers’ Championship, and Michael finished P2 in the Drivers’ Championship. Michael was teammates with Mark Wilkins for a two-car entry by Bryan Herta Autosport. Michael scored 4 wins, 6 poles, and scored 6 other podium finishes this year. 2017: Pirelli World Challenge, SprintX Pro-Pro and Pro-Am GT Class, with K-PAX Racing using a McLaren 650S GT3 Race Car. Michael first competed with the #98 McLaren in the Pro-Am GT Class and then he was moved to the #6 McLaren in the Pro-Pro Class with Bryan Sellers. The inaugural ICGTC California 8-Hour event at Laguna Seca, in Preston Calvert’s Porsche 911 GT3R with the GMG Motorsports team. A P2 finish, overall, at the 25 Hours of Thunderhill in Preston Calvert’s 911 GT3 Cup Car with the Competition Motorsports/Calvert Dynamics team. 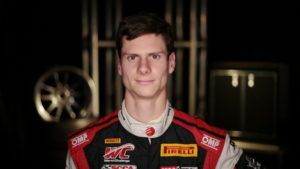 For the 2016 season, Porsche Motorsport North America (PMNA) granted Michael with the status: “Porsche Motorsport North America Young Driver.” Michael was teammates with Patrick Long for a two-car entry by EFFORT Racing/Curb-Agajanian and Michael was teammates with Preston Calvert and Andrew Davis with Calvert-Dynamics/Curb-Agajanian. *Participated in 2 out of 3 Sprint X Pirelli World Challenge races as well: Michael won two out of the six total races (only entering in four of the six races), with 2 pole positions and 3 fastest laps as well. Michael was always the fastest Porsche driver in Sprint X.
Michael officially turned “Pro” status at the Round 4 Barber Motorsport Park event. 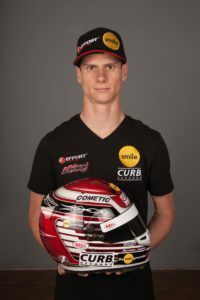 For the 2015 season, Porsche Motorsport North America (PMNA) granted Michael with the status: “Porsche Motorsport North America Young Driver.” Michael was teammates with Ryan Dalziel and Renger van der Zande for a two-car entry by EFFORT Racing. Results below are for the overall finishing position. 2014: USA IMSA Porsche GT3 Cup Championship, Platinum Class. For the 2014 IMSA Porsche GT3 Cup Challenge, USA, Michael raced with a financial scholarship from IMSA, Yokohama Tire, and Porsche Motorsport North America. This scholarship was a result of his success at the exclusive Porsche Motorsport Young Driver Academy held at Barber Motorsports Park in November of 2013. * Participated in Oak Tree Grand Prix (GTD, GTLM). Finished P10 in GTD Class. Competed with GB Autosport as a substitute for their usual driver. Michael earned the ride and raced on merit.